Since discovering AWK last year I've been using it regularly with tables of data. It seems like everything I do with those tables is faster and easier with AWK on the command line than the same jobs would be with spreadsheet software. Below are a couple of examples that demonstrate the handiness of the print command in AWK. If you've never used AWK before, see the links at the end of the article for a quick introduction to the basics. The AWK print command is a simple concatenator that strings together whatever bits and pieces you tell it to print, including field separators. That makes AWK a great tool for adding blank columns to a table. Suppose I wanted to add a 'Rating' column before the 'Restaurant' one, a 'Mobile' column after the 'Phone' one, and a 'Website' column after the 'Cuisine' one. 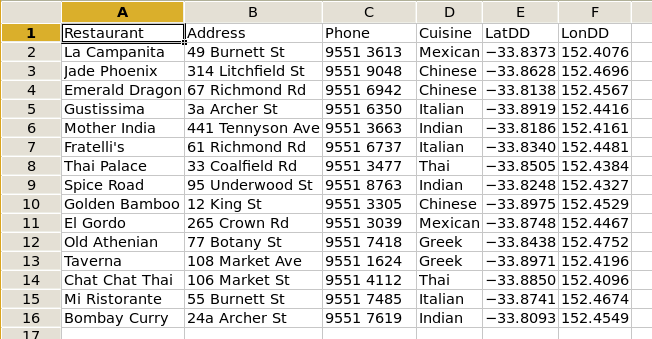 If I had the table in a spreadsheet application like LibreOffice Calc, I would highlight the column to the right of a proposed new one, put the cursor on the top of the column, right-click and choose 'Insert Columns'. I would then repeat the process for each new column. In a previous article I explained how to code a KML file for use in Google Earth and other spatial browsers. I also showed how to generate a large number of placemarks using a spreadsheet formula. AWK does this second job a bit more cleverly, with the print command. 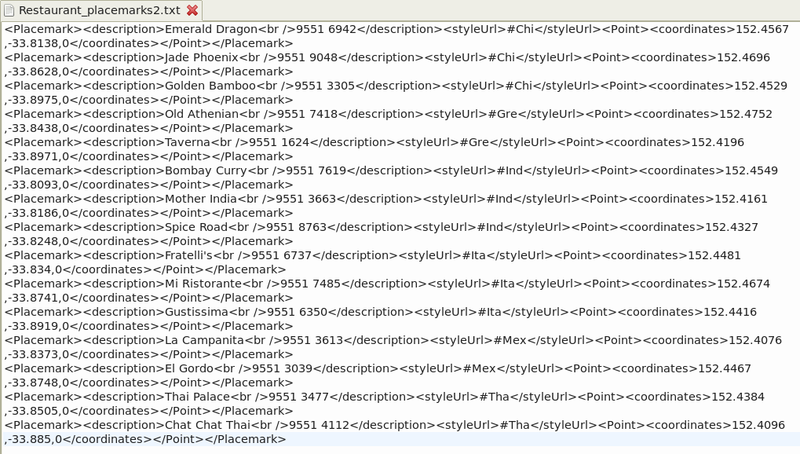 This might seem like a long-winded way to build placemarks, but I use a version of that AWK print command in a shell script to pull as many as 2000-odd placemarks with up to 30-odd style codes out of a spatial data table – in the blink of an eye. More and more of my spreadsheet tables are going into tab- or comma-separated text files, where I can get my AWKish hands on the data and do complex tasks easily and quickly. I don't have a UNIX background, and finding AWK has been like stumbling across buried treasure!